This section of our site is basically a virtual campus offering online audio, articles, publications, presentations and videos to assist with your professional development as a Morinda Presentation. The content comes from Dennis’ international travels to coach, train and mentor in the field, as well as from his colleagues who wish to share. The purpose of this section is to gather all of his training materials in one place so people may find and utilize these tools. Wherever he goes consultants always ask for copies of his presentations. 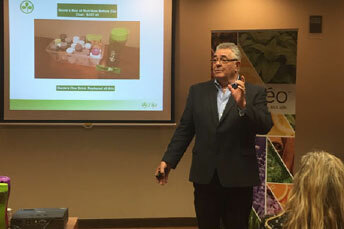 With this website all of these materials will be available to the registered Morinda IPC free of charge. Register NOW to receive access to all these powerful Training Resources! Ask yourself this question: “If a 3 year old child brought you a 2 pound bag of M&M’s would you open it and give that child the whole bag?” Of course not! If we did the child would try to consume the whole bag and then they would get sick and make a mess. Guess who would have to clean it up? Yep… you would. What if you gave the child 3 M&M’s? The child would take those three M&M’s and would eat them and then come back for more. You control the dissemination of the M&M’s. The same thing happens in our business. Many of us try to give the whole bag of M&M’s to our clients. The client tries to consume the information but because we have given them too much, too soon they get overwhelmed and then they move away. Guess who cleans up the mess? Yep… you do. Just like the child with the M&M’s we must pace the amount of information we disseminate to our contact and clients. Partake of this information in this section as if it were a two-pound bag of M&M’s. Take a few, put into practice the concepts and then come back for more. To know and to not do is to not know.